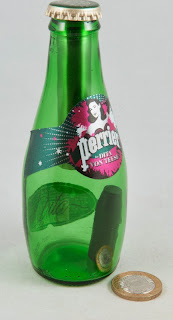 Wil’s new Perrier Puzzle Bottle has a steel tube fixed into the mouth and a bullet-shaped plastic rod languishing inside the bottle … only this time there’s no envelope with the solution provided (by the way, don’t get your hopes up – that solution was a slip of paper with the word “Solution” typed on it! 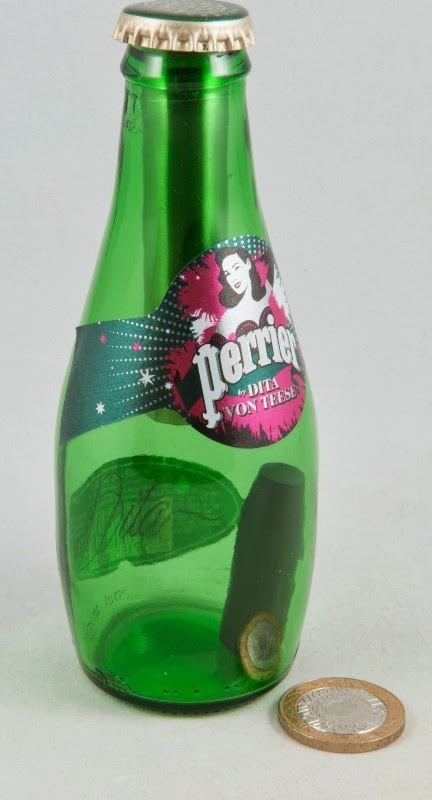 Wil hasn’t gone soft…) and there’s a cap over the mouth of the bottle. After a bit of head scratching and some experimentation I manage to stumble across something I hadn’t expected and then as a grin progressively works its way across my ugly mug I work out what the elegant solution must be, and it works perfectly – and it really is elegant! 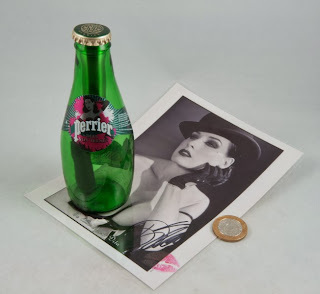 Wil’s new Perrier Puzzle Bottle comes in two flavours – there’s the somewhat limited edition version with the Dita Von Teese branding, and “personalised memorabilia” – limited as Wil was only able to snag a few of these bottles – and a standard version providing exactly the same puzzle but in a standard Perrier-branded bottle. I suspect that the former will all have gone by now, but Wil should still have the standard version available if you drop him a line. 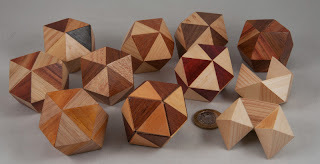 Ages ago I found myself chasing my own tail on an auction of Chinny’s set of Pennyhedrons – I’d been the only one bidding on a particular set and in spite of outbidding myself several times, I was still coming up short against the invisible reserve price and in the end I lost out to said invisible foe. 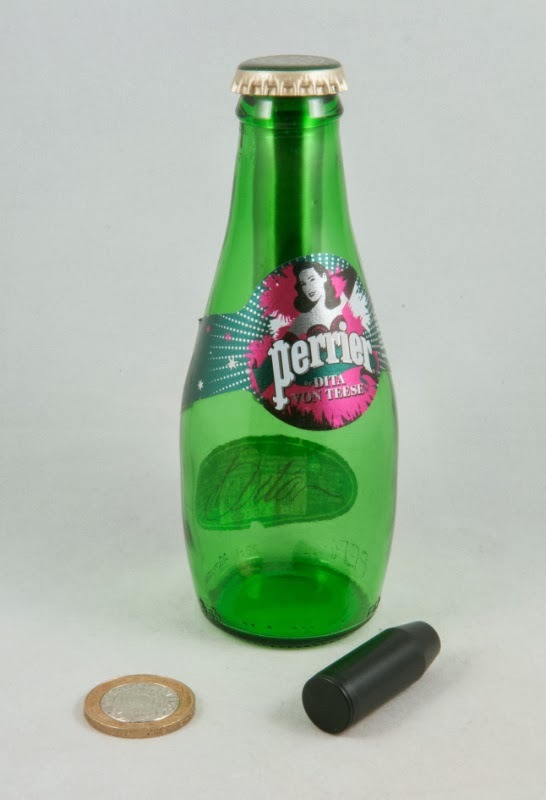 I’d managed to snag something else by Chinny on the same auction so asked him how far away from the reserve price I’d been, and when he told me, I offered to buy it from him at that price and sent him the Paypal straight away (turns out I’d been reasonably close). 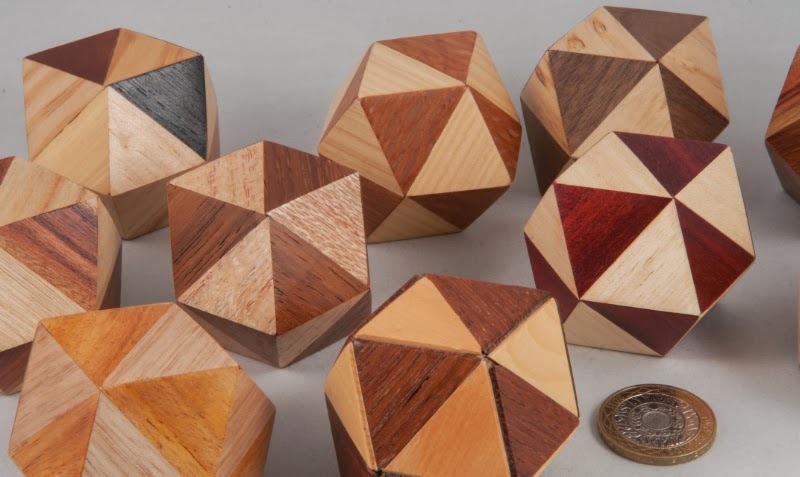 A few weeks later I picked up a bunch of things from him in Narita… including this lovely set of Pennyhedrons, which were instantly shared around in the lobby of the IPP hotel and they kept several people amused for ages … actually they kept me amused for considerably longer! Pennyhedrons were first described by Stewart Coffin in his book “The Puzzling World of Polyhedral Dissections” as simple puzzles created by his children out of workshop scraps – the first variant needed an unusual grip to separate the two parts and had a hole in the centre that held a penny. They were sold at craft fairs as “Pennyhedrons” … not long after that the fertile mind noticed that he could produce very structure that looked identical on the outside, but required very different grips or movements to release them… and a family of Pennyhedrons was born. Chinny has produced an interesting variation or two of his own and in the course of his research had documented all of the known variations on the theme … but being an ace craftsman, there’s very little point in just documenting them, so he produced a couple of sets of all the variants that he could find and put some of them up for auction … and I suspect that one of the sets ended up going to Master Coffin as a gift from the nutty dentist. One of them – a three-piece monster in the darker wood at the back right of the group photo has kept me out for several months. Chinny’s fit and finish is so good that when these guys are together, most of the time you cannot see where the joins are going to be coming from or which way to pull, or indeed push the various facets… and how the heck he gets them to snap together at the end, I have no idea! Anyhow, back to this dark and evil monster – I’d been trying to work it out for ages and had it up in front of my PC monitor so that I could try a new theory every now and then – usually with not luck whatsoever – until recently when I managed to get it to just about start opening – I changed grip a bit and instead of opening, it snapped firmly shut, biting me in the process… even knowing what I knew, it still took me a few more day to get it open … and working out how to close it properly took another few days – it is mean, and it bites too! I picked up a copy of Goh Pit Khiam's Retrofit Puzzle at the recent Dutch Cube Day. I think it was one of my fiver-for-anything-on-the-table purchases from Jan – but I could be wrong on that – it’s definitely worth more than a fiver! 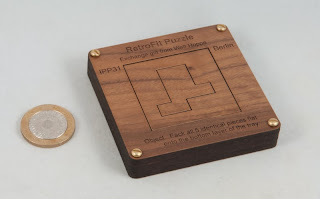 Retrofit was Walt Hoppe’s exchange puzzle from IPP31 in Berlin. It’s a neat little tray-packing puzzle where your aim is to fit five identical pieces (yes, I checked!) into the tray … the one little snag is that the tray has an overhang inside its lip which restricts the access rather a bit. It’s a neatly designed puzzle that puts the fifth piece inside a cut-out in the tray’s lid- which means that simply wrapping an elastic band around the puzzle keeps everything together nicely. I’d played around, rather unsuccessfully with Retrofit for a little while, so when I headed north for a conference in Edinburgh recently, I took it along to pass the time in airports or on planes… and as luck would have it the first time I got a chance to pull out a puzzle was on the flight back down to Brum. I came up with a few potential candidates, but then failed totally at trying to work out how I might get them physically inside the tray… those sticky-outy-bits really manage to get in the way a lot! About half-way through the flight I’d abandoned my “logical” approach and began experimenting with interesting shapes and symmetries (interesting concept with five identical pieces!) and them stumbled across something rather interesting that lead me to the solution, which is really surprising and very elegant. 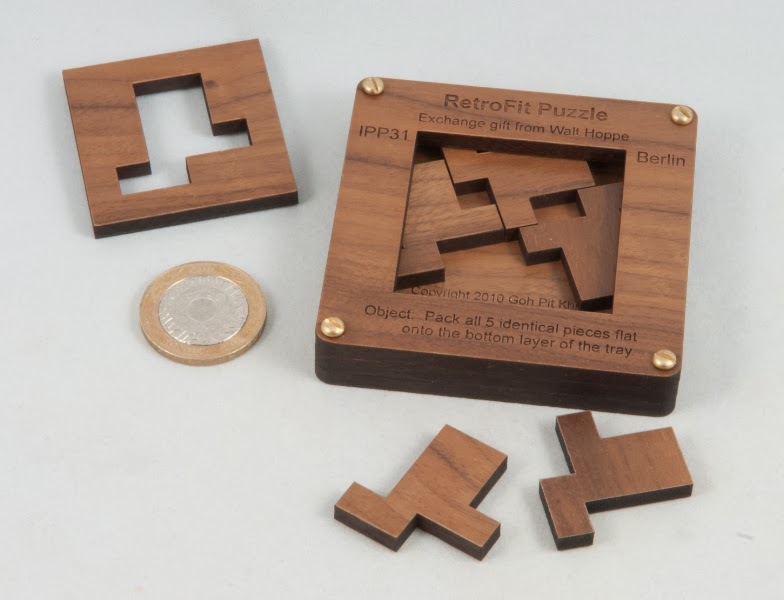 Cute travel puzzle that provides a nice little challenge, without leaving you tearing your hair out for days on end. 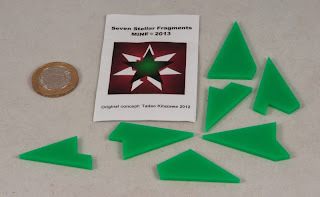 I picked up a copy of Seven Stellar Fragments from Mine’s little stall outside Izumiya on our IPP day-trip to Hakone. 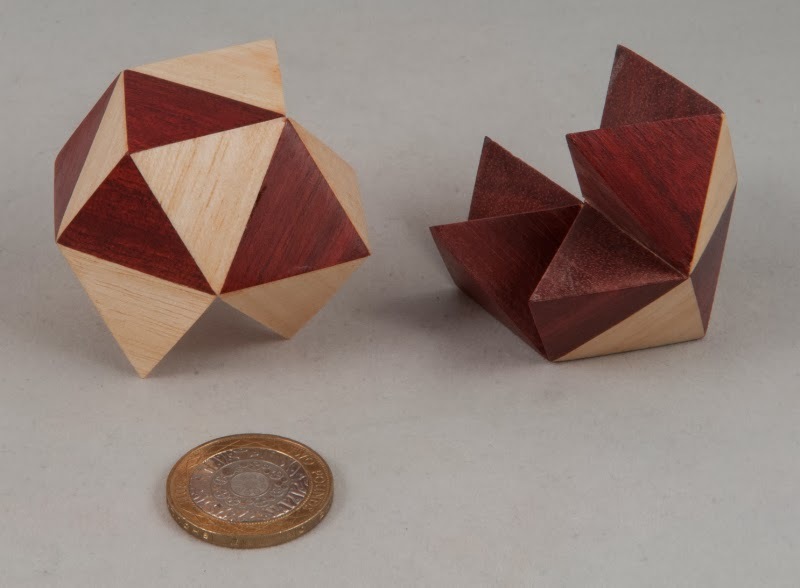 I gave this one to a few folks to play with during the course of IPP and I think that Sherpa-Supreme Marc P was the first, and possibly the only, person who solved it there (doubtless I’ll be reminded of hordes of others in due course!). Seeing his solution on the fold down tray table on the express into Tokyo served to confirm that the target shape was a standard, regular pentagram … on its own, not a huge amount of help! Back at home I’d pick it up and have a bash at it every now and then, and normally end up trying the same things over and over willing them to work better, before putting it away and switching my attention elsewhere before having to admit I was thick! The solution is pretty wicked – the internal cuts have been made deliberately very confusing, and Mine has succeeded on that front very well, making it a pretty darn decent challenge.